Goodness Gracious: Gyoza! | Delicious! Delicious! Caryn and Winnie sit on pillows on the floor around the coffee table. Armed with a fancy set of chopsticks, each girl is devouring her own plate of tender dumplings stuffed as full as they can get. I never understand why people take the time to make perfect pleats on these things. Who looks at the pleats? No time to examine them on the way to my mouth. Caryn dips the last dumpling in the dark sauce and finishes it off. Winnie sets down her chopsticks. Still no sign of him? No. I’m getting bored. Maybe it’s time to look for another job. There’s no pleasing you, is there? Either you’re overworked and wanting to quit, or you’re bored…and wanting to quit. I can’t keep up. Caryn starts to clear the table. All I know is that celebrities are weird. Who can keep up with them? She plops her hands on her hips. Maybe I’ll go to law school and become a lawyer like you. That seems interesting. Winnie snickers at the thought. She gets up and follows Caryn into the kitchen. This is a fairly traditional recipe for gyoza. You can substitute half the pork with an equal amount of minced, raw shrimp. Or chicken. Or use all vegetables. The mix is easy. The folding and pleating is the labor-intensive part. 1. Salt cabbage in a collander over a large bowl. Toss to combine. Set aside for 20 minutes. 2. Combine pork through sesame oil with hands in a large bowl. Squeeze excess water from cabbage. Add cabbage to pork mixture and stir until well-combined. 3. 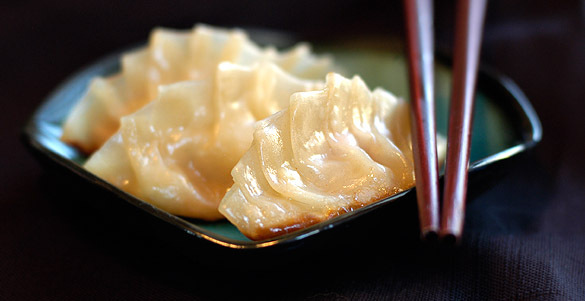 Place a rounded teaspoon of pork mixture in the center of the gyoza skin. Wet the edges of the skin with water on your fingertip. Fold in half to form a semi-circle. Make pleats along the edges, squeezing tight to seal and tapping the bottom on the work surface to flatten. Set aside and repeat with remaining skins. 4. Heat 1 TB. of oil in wok or large, non-stick skillet over medium-high heat. Place about ten gyozas in wok and pan fry until bottoms are golden brown, about 2 minutes. 5. Pour 1/4 cup stock into wok and cover with lid to steam gyozas until cooked through, about 4 minutes. Remove from wok and set aside. 6. Heat another TB. of oil in wok. Repeat process with another ten dumplings until all are cooked. Serve hot with dipping sauce. OMG, Caryn, you put up a recipe I have been looking for! Thank you! It sounds perfect! Now with the dipping sauce, does the sesame oil give it a little spice? I have had some dipping sauce that was nice and spicy. Yum. But I know that Caryn isn’t going to quit. She just needs something that smells so good, Mr. R. *has* to come down to the kitchen. Rainey, there’s a great dumpling house in San Gabriel that is wonderful! I wish I could remember the name. I love watching the guys there make the dumplings. My next quest is to learn how to make my own wrappers. Leanwoo, no, the sesame oil doesn’t spice it up. Use chili oil instead for a little kick. I’ve also used fresh, minced thai chilis to pack a little heat. I wish I could eat one of those right now through the computer! Yum! Thanks for the recipe! Caryn, I think you’re thinking of Din Tai Fung dumpling house. It is delicious, but that Taiwanese joint is unlikely to call its treats gyoza, which I believe is a Japanese term. Be sure to visit with your best-looking friend. Beautiful photo! They look remarkable. Wow, your photos are always lovely, but I think this one is my favorite so far. Gorgeous! The photos on your blog look lipsmaking delicious. Too bad, I am a pure vegetarian. Though enjoyed reading your blog. Caryn, your gyoza looks irresistible (and you’ve made me homesick…)! hi caryn, beautiful photo. this recipe is similar to my chinese dumplings but you’ve made them look great with the crimping on top. nice blog! i’ll be visiting your blog more and more. It’s a nice photo. I love gyoza too, but I used to have without pork. I like the pictures of the food. They looked yummy! Hi Caryn, I liked the pictures of the food. They looked yummy. I wish that i could have some of it. Was it good? I bet it was.